Os especialistas da NASA avisam que uma forte tempestade magnética atingirá a Terra no sábado. O surto terá uma potência da classe X que é a categoria máxima de emissão de raios-X. 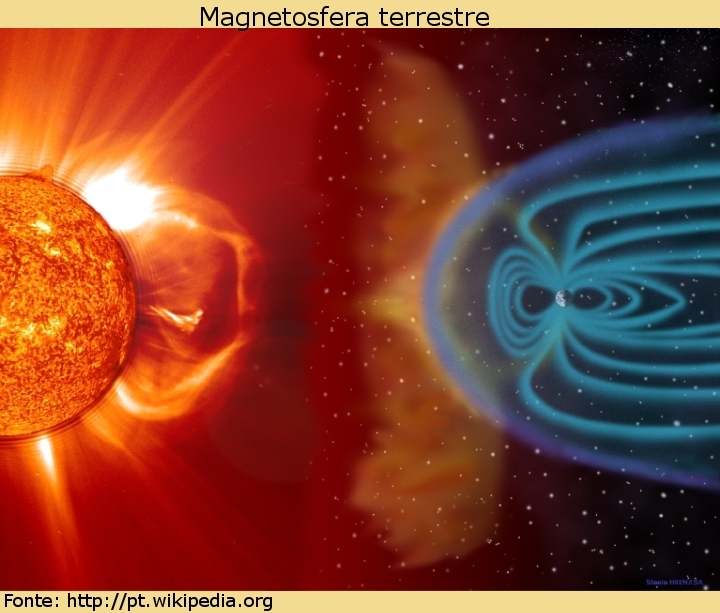 A fonte do “ataque” solar é a região ativa com o número 1520, que um grupo de manchas solares, relativamente escuras, onde as linhas de força de um poderoso campo magnético saem à superfície. Segundo as previsões da NASA e do Instituto de Geofísica Aplicada do Rosgidromet, o choque geomagnético, que aconteceu na quinta-feira, atingirá a Terra no sábado. Nas zonas polares do nosso planeta será possível observar auroras boreais. "The auroras are probably going to be more bright and more equator-ward," Kunches said. Robert Leamon, a heliophysics scientist at NASA headquarters, said the most notable lights will appear on the night side of the Earth when the storm arrives. "It might last into Saturday so you see something in the U.S. or Europe, but if you lived in Siberia, say, you'd probably get the best showing," he said. According to NOAA's scale for geomagnetic storms, the storm heading for Earth - rated low, at a G1 or G2 on a scale of one to five - could be mildly problematic for high-latitude power systems or high-frequency radios. Leamon said some personal Global Positioning System devices, such as his running watch, might be a little slow or briefly lose connections. 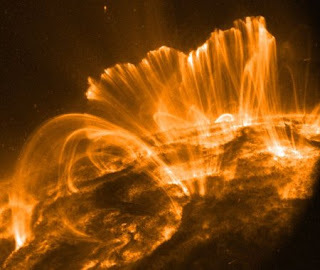 Kunches explained that the burst of energy heading for Earth is called a coronal mass ejection, which means that some of the outer layer of the sun - called the corona - was blown off by Thursday's solar flare. "The corona got blown off. It's like the roof got blown off the house because you were having a great party or something," he said. The storm is expected to reach Earth around 9 a.m. ET on Saturday and continue to affect the planet's magnetic field through Sunday. As odd as the event may seem, Kunches said this storm isn't out of the ordinary. "This is the time the sun should be doing this," he said. "We're in the middle of the cycle - not necessarily the peak - but we're close to it." 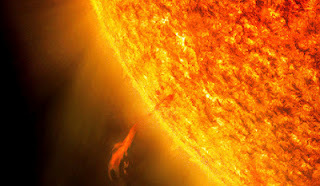 The sun has an 11-year solar cycle, he said, and this cycle's activity should reach its maximum in 2013 or 2014. Given that the storm doesn't pose a threat, Kunches is excited about its arrival. "It's wonderful from a scientific point of view," he said. "Its got some properties that are impossible for us to discern until it gets on top of us."